COMMENTS Comments Off on A fiddle fuelled, frenzied hootin’, tootin’, pickin’ and clickin’ old-time, that’s what. Sound like a mouthful? Exactly. When Gordie MacKeeman’s website is crazylegs.ca what exactly are you in for? First, at Four5Nine (1 March), we were transported by the axis of The Justin Walshe Folk Machine, in solo form, sailing on the fated General Grant only to sink and become skeletons in the sand with ‘Pockets Full of Gold’. Justin’s sparing discord on guitar melded with luscious, vocal textures and, uh, confrontational kazoo in ‘Forever’s Just Another Name’. He affirmed after the kazoo solo that people are often so moved by it they’re unable to applaud. Let’s just say our numbers were few, but our attention wasn’t in deficit. We were later described by the headliner as all being “the strong, silent type”. This guy really is an Aussie-folk machine, a grand answer to the curiousness of what a Maton guitar was doing on stage before a Canadian bluegrass show (without an advertised support act). We also got a lecture about a songwriter’s duty to go forth and experience things other people are too scared or not crazy enough to do, and then share those stories so those others can live through us. Then it came time for Prince Edward Island exports Gordie MacKeeman and His Rhythm Boys to steer us into their territory. 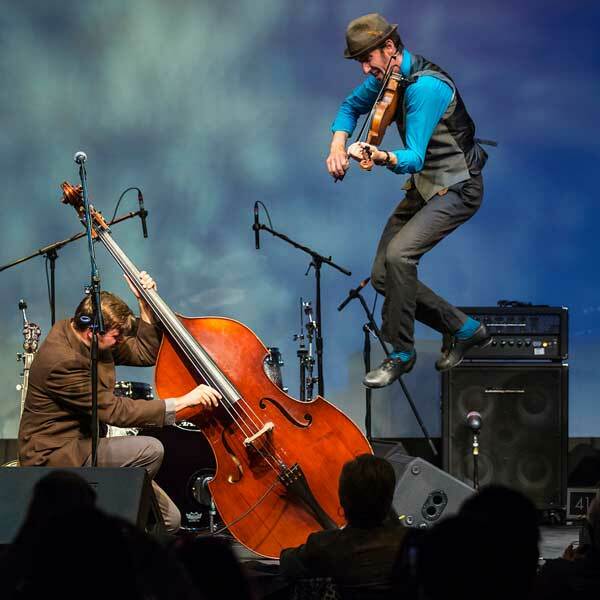 Gordie’s signature crazy legs, in tap shoes no less, kicked and stomped through one of their oldest releases ‘King Ganam Style’, switching between limbs in an instant to smash out some ferocious fiddle. Click here to read our recent Q&A with Gordie. Gordie rarely takes a mic during songs (though occasionally the drum kit), and the diverse skills of His Rhythm Boys mean frequent, smooth stage shuffling. The second track ‘Song To A Young Seagull’ sees Thomas, on upright bass, and guitarist Peter take two mics at centre stage to remind us in perfect harmony about cutting those apron strings. Everyone in the band sings at some point. Peter leads a few early in the set including ‘Goodbye City Lights’ and drummer Jason brings an acoustic guitar and caramel voice up to the mic for ‘Wrong Road Again’ and ‘Said Too Much’. In fact, the drummer deserves his own paragraph: completing the sound with just a snare, one, tiny lone cymbal warrior, and a porch board bass (stomp box) that was shared around the band during the songs he is nailing bass riffage because Tom’s blazing on banjo. One such number was an ode to PEI all-round top bloke and accidental pickle champion, ‘Pickle King Polka’. Having played a healthy mix of previous releases and material from their most ambitious recording project due to happen in May, Gordie MacKeeman and His Rhythm Boys end the evening with two tracks from the 2010 debut self-titled album. Second last is an impressive instrumental take on classic ‘Listen To The Mockingbird’ and finally, the explosive ‘Orange Blossom Special’ complete with a summary of all antics: Tom’s barnyard howling, Pete’s lightning licks and Gordie torturing Jason’s rhythm execution, destroying his bow, crazy legs tapping and kicking and perching on Tom’s bass. It was blistering. It was furious. It wept (in ‘A Maritime Lullaby’). Sometimes I wondered what had just happened, astonished the band keeps pace with Gordie’s fiddle. Then I was inspired to go home and practice. Asking bass/ banjo wielder Tom after the show how long the band’s been playing together, the endearing reply after a thoughtful pause was: “We’re six.” Not sure if they’ll know what I mean, but they sure hit one. Do catch them while they’re ‘oot and aboot and aroond’ Oz.